MacKay River, Boreal Forest, and Tar Mine Northern Alberta. Canada. 2010. The Boreal Forests and wetlands that surround the Tar Sands are the most carbon rich terrestrial ecosystem on the planet, holding almost twice as much carbon per acre as tropical rainforests. 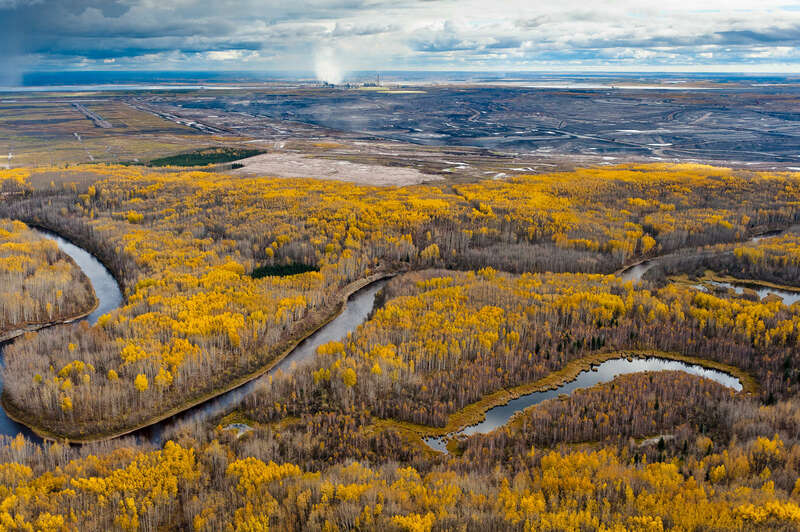 Referred to by the Tar Sands industry as "overburden," these forests are scraped off and the wetlands dredged, to be replaced by tar mines like this whihc produce significantly more carbon that traditional oil extraction. Nikon D3, Nikkor 24-70 f2.8. Shot at 34, iso 800, 1/1250 at f4. Alberta Tar Sands, Northern Alberta, Canada.